Hi there! Ready to have some messy fun? To start out I like to protect the pages behind the ones I am working on. I tend to get a little messy and sometimes careless when I get excited and on a roll! 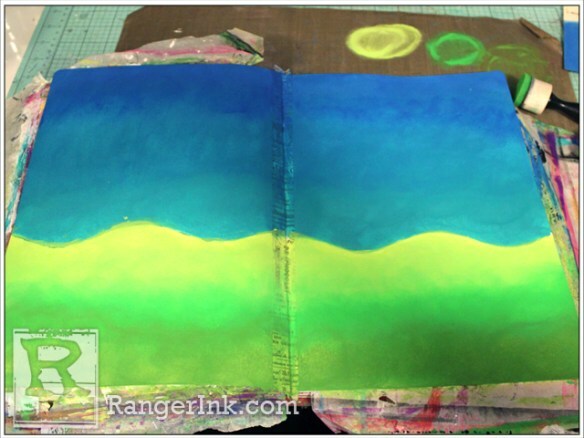 To do this I just use some household wax paper behind each page I am working on. I also like to tape the seam/spine of my pages with either masking tape or washi tape. 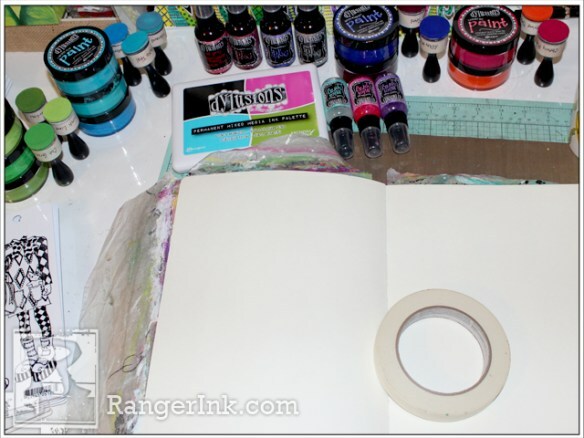 In this picture I have masking tape but I ended up going with Tim Holtz Tissue Tape because it didn’t show up as much once I gesso’d the pages. 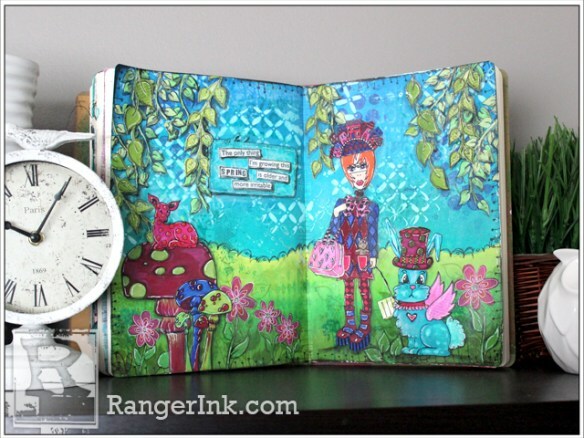 I used the Dylusions Journal Block to divide my pages in two sections. On the top section I used blues (sky) and on the bottom, greens (earth). 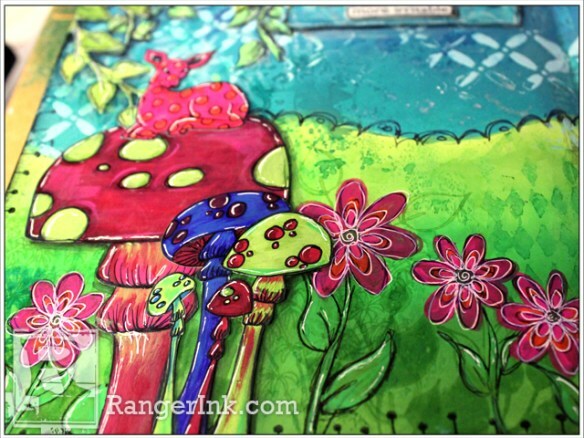 With the Ranger Mini Ink Blending Tool and the Ranger Craft Sheet I used Dyan Reaveley’s Dylusions Paints. I like to have a separate Blending Tool for each paint colour but this is not necessary. 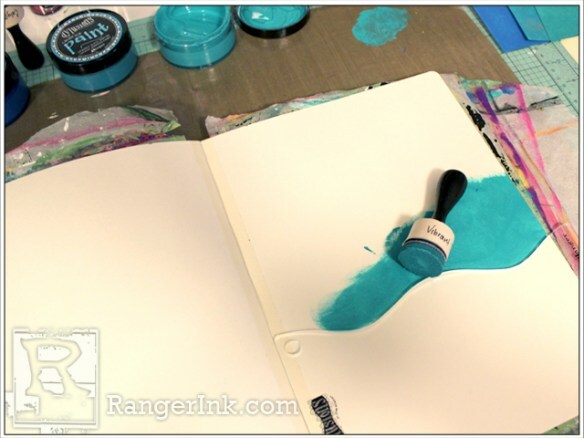 For the sky I blended the colours Vibrant Turquoise, Calypso Teal and London Blue. Using the same technique I painted the bottom portion of the pages in greens using Fresh Lime, Cut Grass and Dirty Martini. Working the colours back and forth until they blended to my liking. But don’t worry if you can’t get the colours to blend perfectly. Once you add the layers it won’t be noticeable. 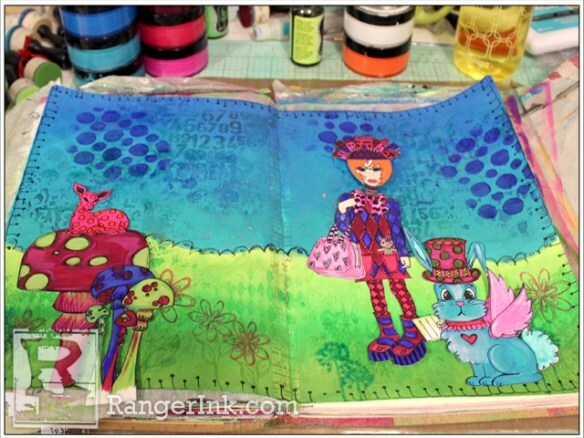 Next comes the fun part where you just add layers upon as many layers as your heart desires. This is the part I love. Here I used: Circles stencil with After Midnight paint; Letter Jumble stencil with London Blue Ink Spray; and Number Jumble stencil with Polished Jade Ink Spray. For some shimmer in the sky I decided to add Dyan Reaveley’s new Mica Spray!!!! She has a set of three beautiful colours – Vibrant Turquoise, Bubblegum Pink and Crushed Grape! Gorgeous!!!! 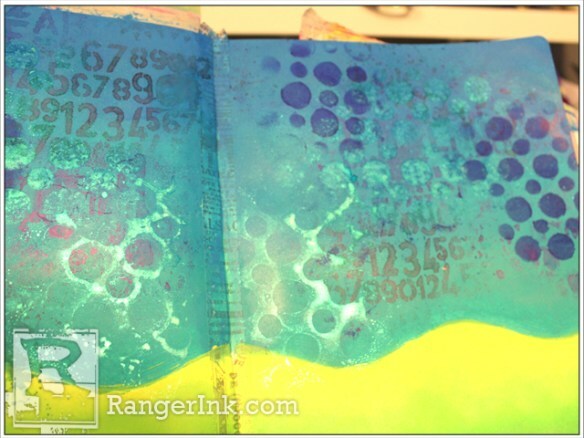 For the sky I used Vibrant Turquoise with the Circles stencil. 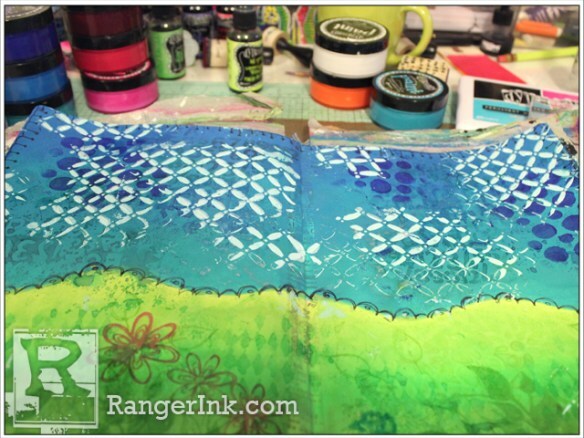 For the bottom portion of layers I used the following: Shattered stencil with Fresh Lime Ink Spray; Flower Medley stencil with Fresh Lime Ink Spray and Diamond of a Border stencil with Cut Grass Ink Spray. 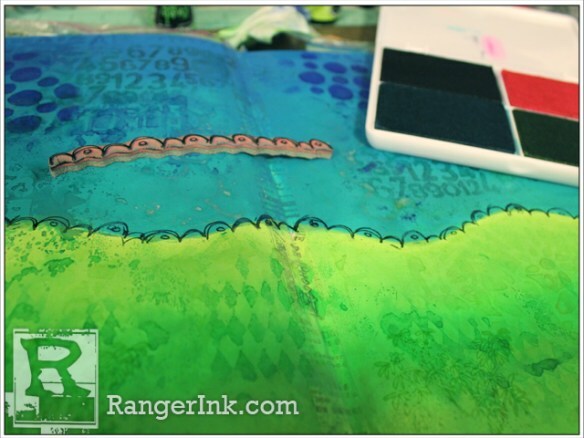 If I don’t get distracted between the stencils/colours application, to allow for drying time – I like to give it a little zap with the Ranger Heat It Craft Tool. 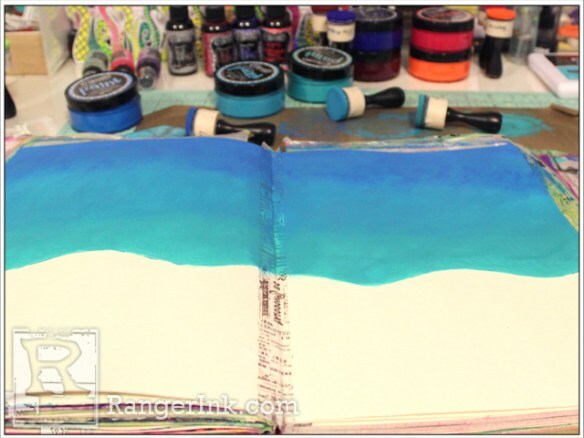 I stamped (Around the Edge) along the wavy edge where the blue and green meet. Also took another stamp from the same set and went around the entire page in Black Marble from the Mixed Media Ink Palette. 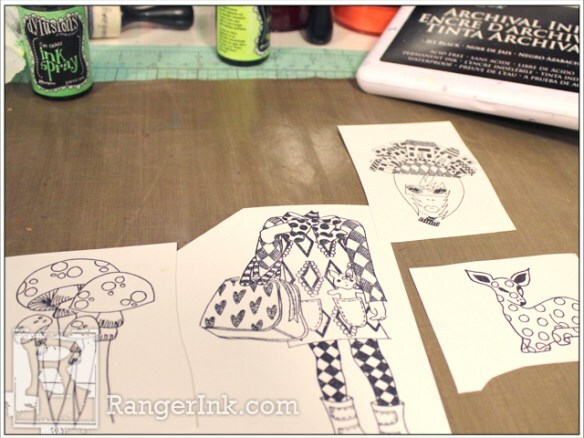 Using Ranger Archival Ink in Jet Black I stamped the body from These Boots Are Made…the head and deer from Oh Deer and the mushrooms from Doodle Parts. 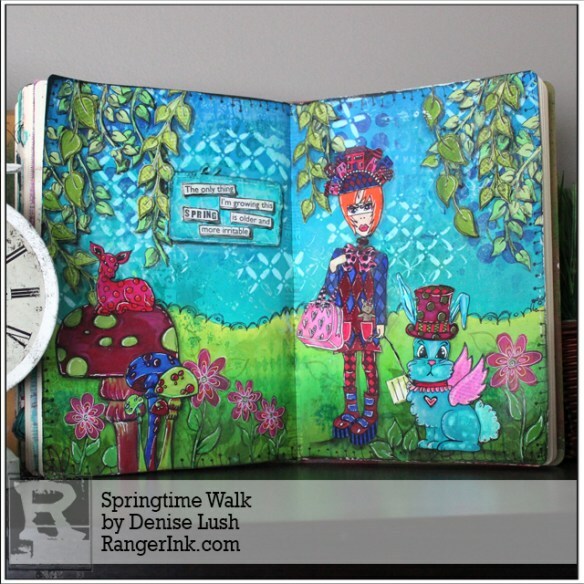 Using Dyan Reaveley’s new Dylusions Paint colours – Dirty Martini, Pomegranate Seed, After Midnight, Tangerine Dream and Cherry Pie, plus some of her older fabulous paint colours as well… I painted all the images I stamped and drew. 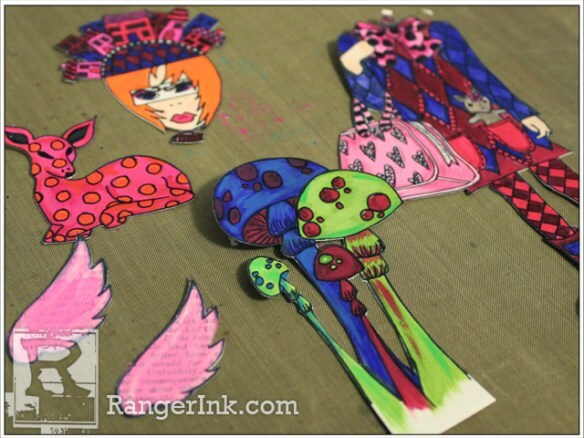 •	Hand drawn mushroom: Pomegranate Seed, Dirty Martini, Cherry Pie and Bubblegum Pink. •	Small mushrooms (stamped images): Dirty Martini, Fresh Lime, Pomegranate Seed, Cherry Pie, After Midnight, London Blue. •	Deer: Cherry Pie, Bubblegum Pink, Tangerine Dream, Postbox Red. •	Woman: After Midnight, Pomegranate Seed, Bubblegum Pink, Cherry Pie, Tangerine Dream. Her skin and the little bunny in her pocket were done with some watercolour paints. 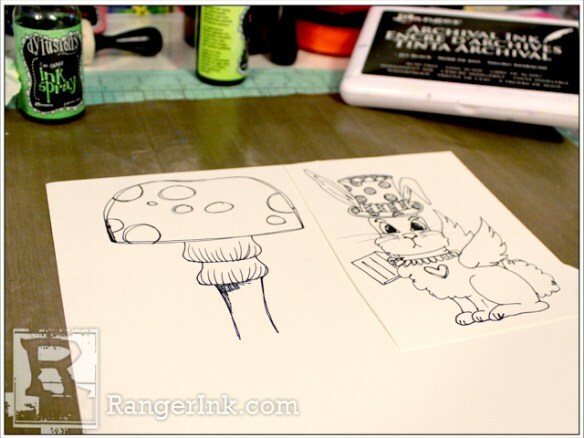 After I painted my images I re-traced the stamped and drawn lines with a Dylusions Black Pen. Also took a paintbrush and dipped it into the Bubblegum Pink Mica Spray and added it to the wings of the bunny. Next I just laid out the cut images onto my journal pages to get a feel for it and to see where I wanted to go next with this piece. I knew I wanted a quote so I decided to stamp it on a separate piece of paper. I wanted some more light blue in the sky so I went with Calypso Teal. 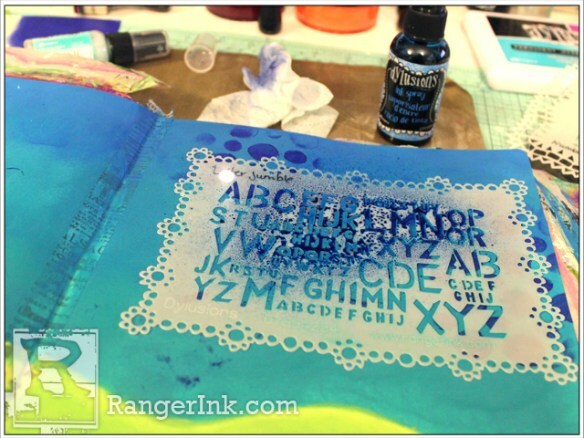 Then added a second layer of Calypso Teal through the Shattered stencil. Then another layer using the Circles stencil and White Linen Ink Spray. I used the quote from Dyan’s stamp set Ugh!! People!! 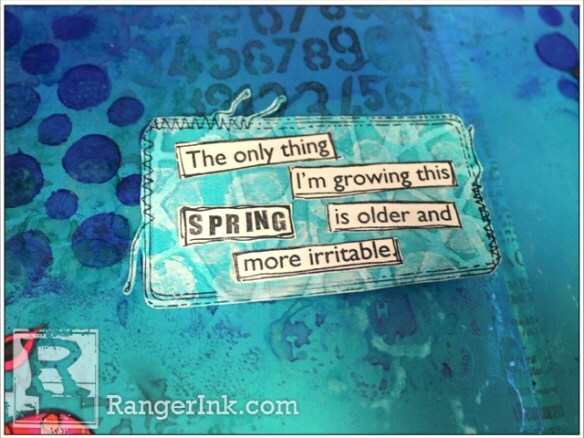 But removed year and replaced it with ‘Spring’. 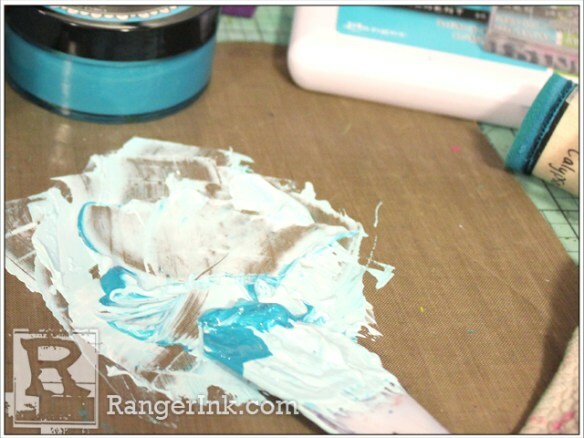 I still felt my sky was too dark so I took some White Gesso and mixed it with a little Calypso Teal Dylusions Paint. I used the centre of the large Alphabet Border stencil. Fingers crossed!!!! I got some on the bottom of my page in the green area. But I am not too worried about it. 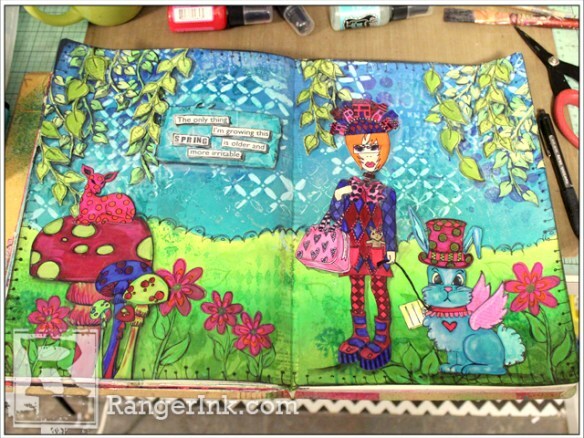 That’s the lovely thing about mixed media and art journaling. It’s your creation! And those little oopsies just add to the beauty and layers in the end! 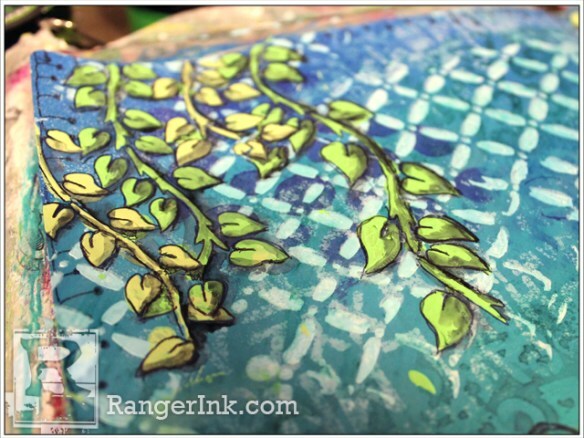 Using the same technique as I did with the White Gesso and Calypso Teal paint… I added some vines using the Leaf Flourish stencil and two separate mixes. One of Fresh Lime and White Gesso and the other of Dirty Martini and White Gesso. I added a bit of Cut Grass as well to the Fresh Lime mixture because it was too light. The colours didn’t turn out quite like I wanted. The White Gesso just lightened the colours too much. So I traced the vines with the Black Pen and then my Stabilo All pencil in black just to muddy it up a little. 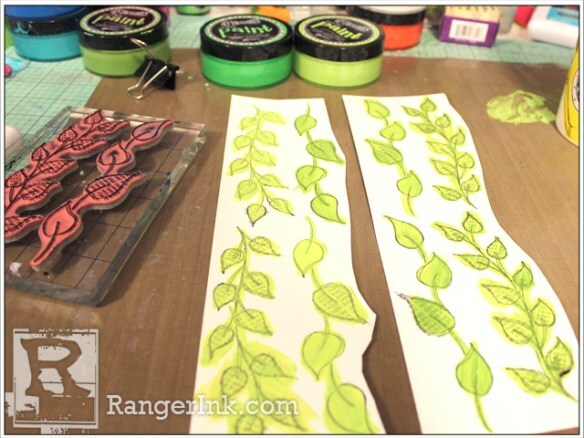 I decided to stamp some leaves on a separate piece of Watercolor Paper with Dyan’s Around the Edge stamp set and Ranger Jet Black Archival Ink. Then I painted them in Dirty Martini and Fresh Lime. 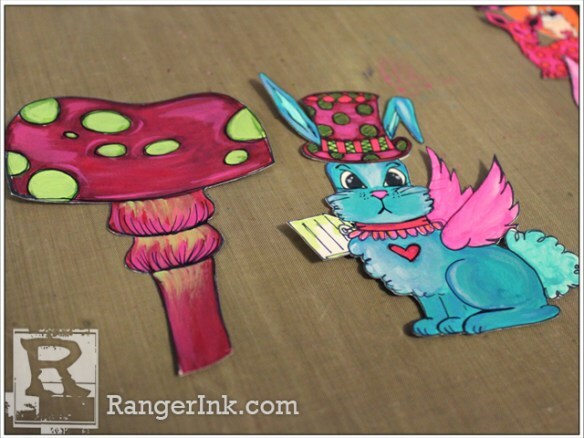 I added all my cut out stamped and drawn images to my layout using Matte Multi Medium. 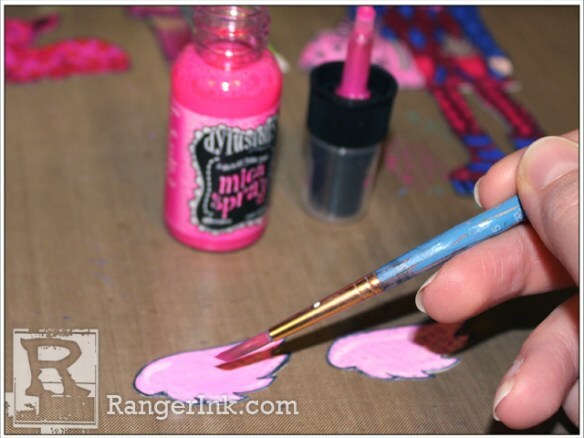 Once I saw it all pulled together I decided I wanted my stamped flowers painted. I used Bubblegum Pink and Tangerine Dream with Cut Grass and Dirty Martini for the centres, leaves and stems. I like to walk away and give myself a little break from viewing my work. Look at it with fresh eyes. Sometimes it makes me realize it really is great the way it is…and sometimes I see what’s missing. This time it was some white markings. I used the Dylusions White Pen. I find adding white touches here and there really bring the images to life and makes them pop! And there you have it! There’s my spring layout! Hope you like it!! !